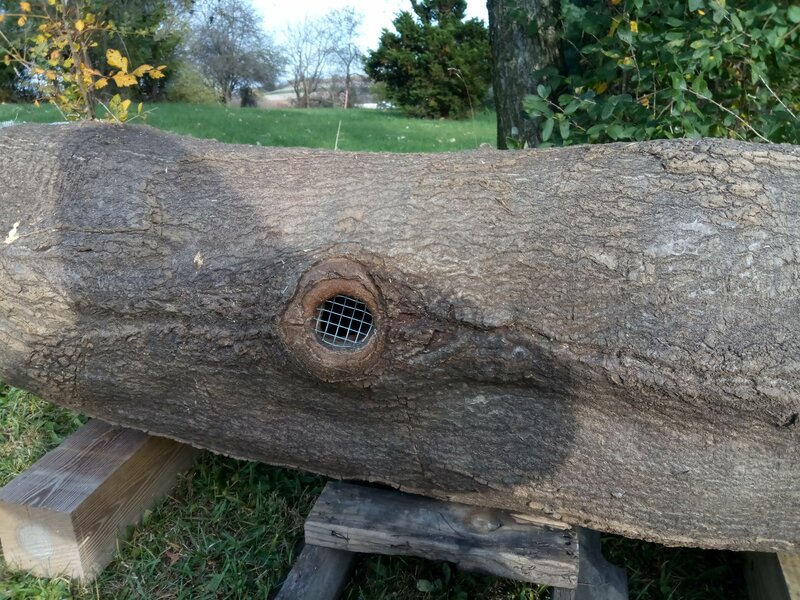 My very own log “hive”. Today was a very exciting day for me. I’ve always wanted a log “hive” or “bee gum”. Well today was my day. 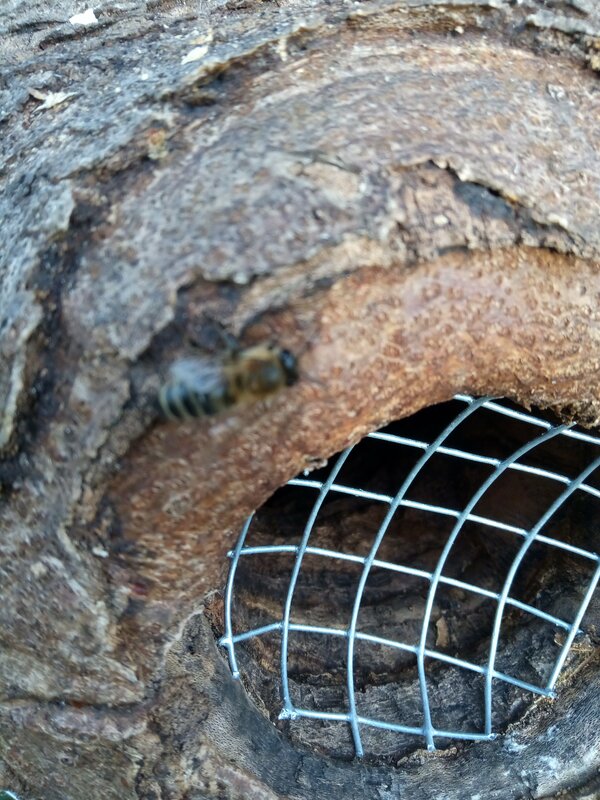 With the help of two good buddies of mine, Mitch and John, a huge section of tree trunk with bees inside, came to rest in my home yard. 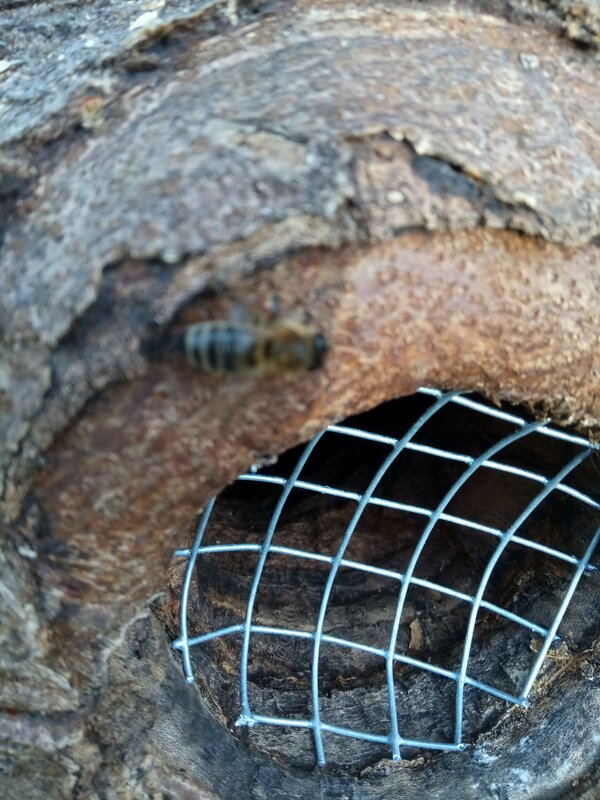 The tree had fallen a few years ago and the property owner had no plans of removing it until a few weeks ago, when he noticed the bees. He looked me up and asked if I wanted the bees. Umm, yeah. So we carefully cut a few feet away from the entrance hole on both sides, but this thing was hollow all the way through. Inside the log, the right side (the bottom when tree was upright) was filled with the finest, moist compost you could imagine to the depth of more than two feet. Above this was an abandoned rodent nest of some kind, and some small animal bones. There were countless beetle grubs within the rotted wood and compost, but not hive beetles. In fact, I never did see one hive beetle or grub. These were as big as my pinky finger. We couldn’t leave all the stuff inside because it made the log too heavy. But I didn’t remove it all. I did fill a five-gallon bucket with the compost. 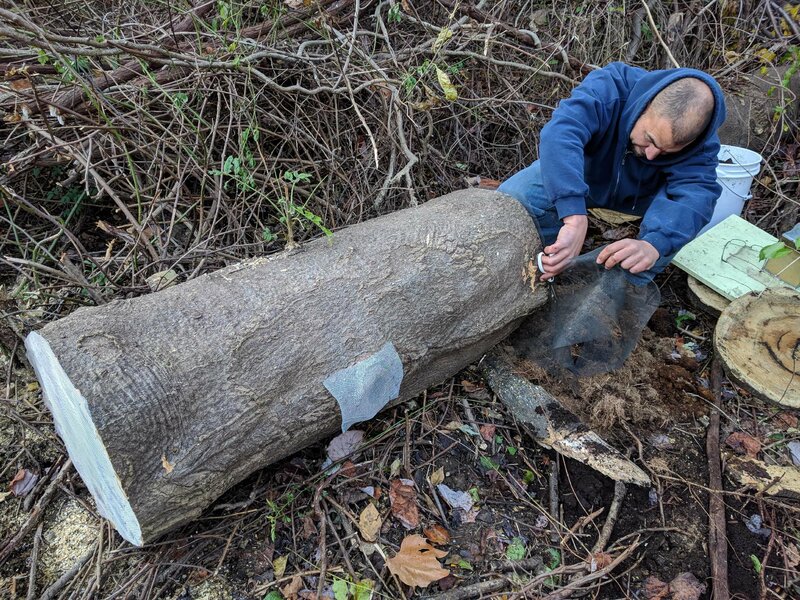 I will add some to a second section of the log that we salvaged that doesn’t have bees in it (yet). John had the idea to cut two “cookies” of wood to use as endcaps. It worked like a charm. When we got it to my place, the only thing I added was a mouse guard. They were foraging and bringing back pollen within minutes. As for the colony itself, it should be interesting to see if they overwinter. It’s not a huge, well established colony. Six visible combs about 4′ wide, 10″ long. No idea how much honey is inside. But they are insulated like no other colony I have. Next Spring, this log is either going to issue some swarms for me, or get one issued to it. I’m going to love observing it for many years either way. Thank you! I have another one now too. I love that I can just let them be, and wait to catch the swarms.